There are moments in which a season can turn. Moments that banish bad memories and bring hope that there are plenty of good ones about to be made. Sometimes those moments are inexplicable. Sometimes those moments feel like they have been engineered by the sporting gods. And that was exactly how it felt in the final moments of Saturday’s game at The Stoop. Saints were slipping to a defeat which would, realistically, have put them out of the race for a top-four place in the Aviva Premiership. As the clock struck 80 minutes, all Harlequins had to do was get the ball off the field. After a solid scrum five metres from their own line, they handed that responsibility to replacement fly-half Ben Botica. He was the man who had landed what looked to be the match-winning penalty. And he was the man charged with the seemingly simple task of ending the game. But, mind-bogglingly, he kept Saints in the match with a kick that somehow stayed in play. 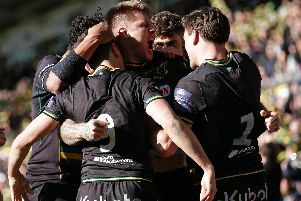 A stunned Stoop cheered and then groaned before watching on as Ben Foden gathered the ball and proceeded to start and finish a move that won Saints the match. No one could quite believe what they were seeing as the ball went through the hands of several Saints players before Foden cut inside and ripped Quins apart. The home side were left dumbstruck as Jim Mallinder’s men engaged in jubilant celebrations behind the posts. And one that gave Saints a shot in the arm. Had Botica got his kick right, Saints would now be sitting 13 points adrift of Quins, who are fourth, in the standings. But as it is, Foden’s score brought about a six-point swing, with Saints now just seven points adrift of their rivals. Crucially, the word after the game was that this can be a catalyst for the campaign. Saints have another half of the season - 11 matches to be precise - still to play. And this victory could prove so vital. Saints so desperately needed it after the woeful defeat to Wasps eight days earlier. And Lady Luck smiled on them. But fortune favours the brave - and Ssints were brave in this game. They played with a swagger during an adventurous first-half display. The wind was the player of the match, having an influence on every move. But Saints had a number of very good performers of their own. On a fast surface, they kept the ball in hand. There wasn’t a single box-kick in sight as Lee Dickson orchestrated some stirring backs play. And Saints’ only qualm was that they weren’t further ahead than the 17-14 lead they enjoyed at half-time. It looked like it wasn’t to be enough when Botica got the ball in his hands. But he failed to twist the knife and Saints made the most of their reprieve with ruthless efficiency. They know it will mean nothing if they now go and lose at home to London Irish next Saturday. But this bizarre moment in a strange season should ensure the wind is back in their sails during the next few weeks.